To find out more about the charity, please visit their website here. Today I dropped Whizz of at the Medical Detection Dogs Centre at Great Horwood where Helen, one of their trainers, took her in for her final scent training. It is difficult handing a dog over as one gets too fond of them, even if one has them for a relatively short period. Whizz, like her predecessors, has made her mark at home and the Garden Centre, becoming very much part of the team. As part of her diet, we cut her dried dog food ration down a little and to make up for bulk she was given a large carrot cut up with her food, and watching her eat she was as fond of the carrot as the rest of her food. Being reasonably enterprising and with a very good sense of smell she soon found my tub of pot grown carrots and much to my amusement and amazement she gently got hold of the top of a carrot and pulled it up. I could not begrudge her our last few carrots, so she helped herself to one every morning when I was hanging out the washing – she looked so pleased with herself and ran around the garden, carrot in mouth, before setting down to eat her prize! We managed to sort out most of her problems before handing her over so we are now really hoping that she will succeed with the next stage of her training. She is a wonderful gentle dog and so good with young children as we have witnessed with our grandchildren, we have high hopes that she will join the young boy in London some time in June and make a great difference to his life and also his mother. We shall look forward to hearing. And now to Whizz! Whizz joined us on 26th January……. WHIZZ is a beautiful dog with an amazing wrinkled face which gives her the look of being permanently sad and worried, especially when she is running with her head down as she has almost a cap of loose skin on her forehead which falls forward in a most comical way – I have yet to capture this on photo. Whizz is a two year old who has been with a lady who does a lot of work helping raise money for the charity, but her family are moving to Somerset so she needs time to get the family home ready for sale. Whizz was due to move on or be matched as she has been with the same person for just over a year, so we have been given her to try to sort out one or two problems. 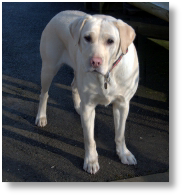 The first was easy, as being a Labrador who loves her food, she was allowed a few too many treats so was rather overweight, but she nearly has her figure back after less than a month. Less food and a lot more exercise and being in the plant office, plenty of stimulation during the day. The other problems are with behaviour which will take a little longer to sort out and make it a challenge whilst enjoying her company! She greatly loves the company of Nia, Chris our publicity officer’s golden Labrador, who is in the same building. They entertain us at regular intervals during the day, but especially first thing in the morning with their greeting ritual, trying to chew each other’s ears, lick faces etc. They are both moulting so we shall soon have a golden carpet under our feet. Like Barton and Alice, she has settled to her new routine and has become part of the Garden Centre team. She is very gentle and excellent with young children, so the Centre has in mind matching her with a child. At the moment she is peacefully curled up in a ball asleep near my feet, but despite the strong wind and heavy rain she will still be keen for a good walk on the way home. At least with modern waterproofs and warm undergarments one can keep relatively warm and dry and it really makes one appreciate getting back into the warmth of one’s home. However, before I will be able to do this I’ll have to get a large bowl of warm water to wash Whizz down as she has very big feet and manages to spread mud all over herself – I’ve never known a dog manage to get so muddy!